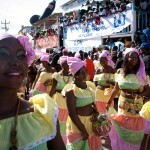 JACMEL, Haiti – Tens of thousands of dancing and singing Haitians gathered this past weekend in the nation’s Carnival capital to celebrate the festival’s revival following a respite caused by the January 2010 earthquake (Click to view photos). The sounds of hammers and saws could be heard throughout the final night of preparations as dozens of carpenters hurried to finish building the wooden bleachers where spectators stood along the parade route in the coastal city of Jacmel. The speed and determination of the construction embodied a feeling of hope among many that Haiti is on track to rebuilding itself both culturally and economically. Click HERE to read the story as it appeared at Info Sur Hoy. PORT-AU-PRINCE, Haiti – During Haiti’s problematic elections last November, thousands of local observers documented the irregularities that occurred in a process that ultimately judged their success to hold a democratic vote. 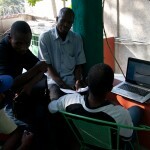 More than 5,000 Haitians from different civil society and religious organizations were trained to learn the election observation process before being assigned to many of the 11,000 polling stations nationwide during the preliminary presidential and legislative elections on Nov. 28. Click HERE to read the full story as it appeared at Info Sur Hoy. PORT-AU-PRINCE, Haiti – Former President Jean-Bertrand Aristide is expected to return to Haiti after nearly seven years in exile. 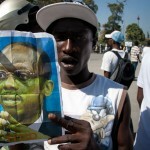 Aristide, who became Haiti’s first democratically elected president in 1991, announced his intention to return to Haiti shortly after former strongman Jean-Claude Duvalier arrived here unexpectedly in January. PORT-AU-PRINCE, Haiti – President Réne Préval said he would not step down until the nation’s next president has been elected, even though his constitutionally mandated term ended on Feb 7. 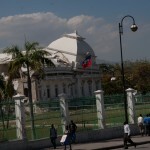 Hundreds of protestors demonstrated in front of Haiti’s collapsed National Palace on Feb. 7, demanding Préval be replaced by a transitional government until Haiti’s election is resolved. 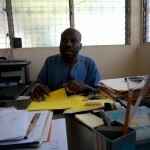 PORT-AU-PRINCE, Haiti – Sony Estéus is the executive director of SAKS (Sosyete animasyon kominikasyon sosyal), an organization dedicated to empowering Haiti’s rural communities through local news and social programming. SAKS, which Estéus co-founded 19 years ago, has helped more than 25 rural and grassroots organizations create radio stations in communities where no local news outlet previously had existed. In an exclusive interview with Infosurhoy.com, Estéus talks about the success of his organization and the challenges of journalism and freedom of the press in the ravaged nation. Click HERE to read the full interview as it appeared at Info Sur Hoy. 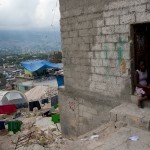 PORT-AU-PRINCE, Haiti – While foreign reporters flock to Haiti to cover major breaking news, Haitian journalists said they are reporting on the events that have devastated the nation during the past year with a “work as usual” attitude. The earthquake that struck Haiti on Jan. 12, 2010 closed radio and television stations and destroyed the office of at least once major newspaper, making reporting nearly impossible at a time when good journalism was needed more than ever, journalists said. 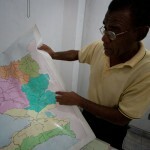 Haitian journalists had been accustomed to working in tough circumstances that range from low and unsteady wages to lack of training in investigative techniques – and that was before the impoverished nation was hit by a massive earthquake and a deadly cholera outbreak. PORT-AU-PRINCE, Haiti – Opposition candidate Michel Martelly earned the second-highest number of votes in Haiti’s troubled Nov. 28 election – not government-backed candidate Jude Celestin, according to an investigation by the Organization of American States (OAS), which observed the election. 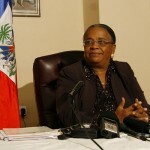 “The Expert Mission has determined that it cannot support the preliminary results of the presidential elections released on December 7, 2010,” reads the report, which was delivered to President René Préval on Jan. 13 and made public Jan. 18. PORT-AU-PRINCE, Haiti – Today, Haitians across the country will pause to remember the earthquake that devastated their nation exactly a year ago. They will sing and pray in unison outside the ruins of Haiti’s national cathedral. Some will gather to discuss the upcoming election; others will talk about the role the United Nations Stabilization Mission in Haiti (MINUSTAH) has had in maintaining order; and others will discuss the reconstruction process. But Islande Vilmeus will not be participating. While others choose to remember, the 30-year-old wants to forget – forget that her tonton, the uncle who raised her since her parents died at age 10, was among the about 300,000 who died in the earthquake. She wants to forget that, two weeks ago, she returned from the market to find her 5-year-old son dead on the floor of her tent from an unknown cause. She said he might have been poisoned. The boy’s body lies unclaimed at the local morgue since she can’t afford a funeral. 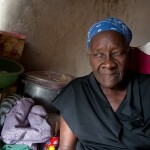 Vilmeus and her six other children survived the earthquake that brought their home crumbling to the ground. But they are not surviving its aftermath, she says, as she cradles her 10-month-old son Abraham who hasn’t eaten yet today. PORT-AU-PRINCE, Haiti – Nearly a year since a 7.0-magnitude earthquake destroyed the nation’s capital and surrounding areas, much work remains in the reconstruction process that’s way behind schedule. More than a million remain displaced in unsanitary – and unsustainable – tent cities, many without consistent access to clean drinking water, according to the U.S. State Department. The majority of buildings throughout Port-au-Prince are in the same collapsed state they were in after being pulverized on Jan. 12, 2010. Fewer than two million of the nine million cubic meters of rubble have been removed, and debris still clogs city streets, according to the U.S. State Department. Click HERE to read the full article as it appeared at Info Sur Hoy. PORT-AU-PRINCE, Haiti – Political tension is mounting in Haiti as candidates and voters await the final results from the November presidential election. Controversy erupted as to which candidates will advance to the Jan. 16 runoff after thousands of voters were turned away from the polls during the first round of voting since their names did not appear on registries.